The fifteen year four month career of D5096/24096 was split between North Eastern Region (11 years) and Scottish Region (4 years) allocations. Time between last Classified repair and withdrawal: 2 months. August 4th 1975 - stored serviceable. After withdrawal 24096 was stored at Polmadie during August 1975, then stored at Eastfield during September & October 1975, then at Glasgow Works between October 1975 & January 1976. It moved down to Doncaster Works on January 23rd 1976 and was broken up between July & September 1976. Movement: 24003/12/18/96 Glasgow Works – Doncaster (via ECML) January 23rd 1976. Noted Darlington Works May 1961. Noted Darlington Works November 1961 - January 1962. Noted Derby Works April, May & July 1966. Noted Glasgow Works February - May 1971. Noted Glasgow Works August 1971. D5096 was the first of the Class to be delivered to Gateshead and was released from Darlington Works on April 9th. The Newcastle area had become home to the first of its Type 2s, D5096, working out of Gateshead, Heaton and South Gosforth. It worked the 9.40am Newcastle - Newbiggin parcels on April 19th, was noted at Edinburgh Waverley on April 23rd with a test train and it reached Scarborough on April 30th, later being noted on the morning Carlisle parcels on May 9th, 11th, 12th & 14th, by which time D5097 had been released from Darlington. The Type 2s had returned to handling the Newcastle - York - Leeds services, D5097 on 7.30am Leeds - Newcastle and 11.05am return (July 9th) and D5099 on 11.40am Leeds - Newcastle and 5.33pm return (July 9th). By month end they were being used in pairs, so noted were D5100 & D5096 handling the 12.05 York - Glasgow relief. 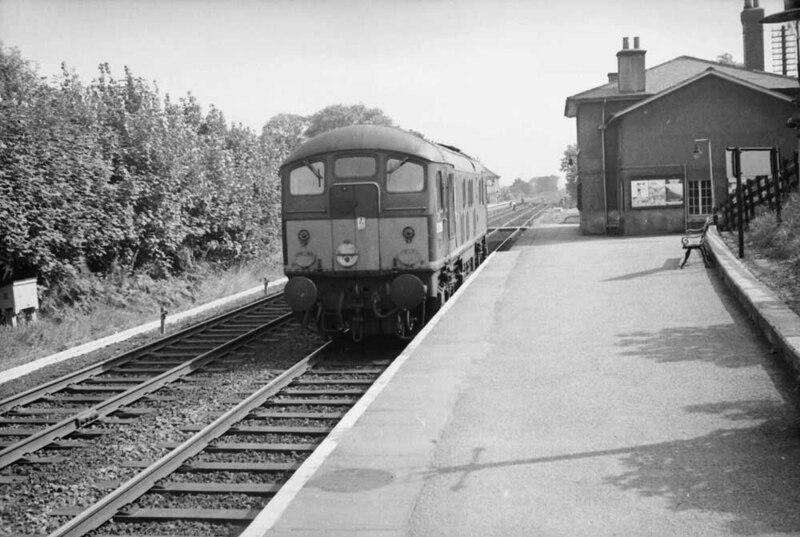 As the diesel locomotive and diesel multiple unit fleets grew so the impact on steam workings escalated. Typical was the closure of Scarborough shed on May 18th, the two diagrammed steam freight workings turned over to D5096/98/99, 5100 & 5176 the following Monday. Condition September: green livery with small yellow warning panels, curved upper corners, steam style shedplate on cab front. On Sunday March 7th D5096 was stabled at York, along with D5098, D5099, D5100 & D5239. On June 10th D5096 handled a Malton – Coventry private excursion throughout. Condition June: green livery with small yellow warning panels, curved upper corners, bottom of warning panels appears to cover the frame level stripe, full size water tank, shortened fuel tank, no blanking plates fitted, hand/footholds in place, three-rung bogie mounted footsteps, ridge sided sandboxes, steam style shedplate on cab front. The bringing online of the large Ferrybridge ‘C’ generating station at the beginning of July saw D5096 with a two coach inspection special utilize the new rail connection for the first time. On Saturday August 14th D5096 was noted light engine at Leeds City. Outshopped from Derby about June, repainted. On March 3rd the evening York – Aberystwyth mail started its journey behind D5096, at Shrewsbury 75033 took over for the run to the coast, thus positioning this locomotive to work the last ‘Up’ Cambrian Coast Express. Photograph collection of webmaster. Class 24 No.5096 at Woodlesford during October 1967, the locomotive is on the 'Down Line' heading towards Leeds, possibly heading light engine back to Holbeck. The buildings on the right are the original station buildings (now gone, replaced by and a car park). The platforms here are staggered, a small portion of the up platform and Woodlesford Signalbox are just visible behind the locomotive. Looking into the distance your next box would be Methley Crossing then Methley North Junction, if the cameraman would have turned round, it would have shown you the distant signal for Waterloo sidings signalbox and the beginning of the four tracks into Leeds. The afternoon Leeds City - Patricroft parcels was a regular Holbeck Type 2 working, noted in January were D5147 (10th), D5096 (12th) & D7573 (26th). Condition April: blue/yellow livery, full size water tank, shortened fuel tank, blanking plates fitted, hand/footholds in place, three-rung bogie mounted footsteps, ridge sided sandboxes, most valencing still fitted, steam style shed plate on cab front. On the late evening of June 5th 5096 on the 2M72 23.18 SO Newcastle - Carlisle became a failure at How Mill, Kingmoor sent out 5191 to rescue the service. The Blackpool Illuminations over the weekend of September 23rd/24th provided a wide variety of specials in to the area. Perhaps those with the most interesting motive power came from Scotland, noted were 5096 & 5001 and 5178 & 5385 on two of the ten specials from the ScR. On ????? the loss of 5357/98 scheduled to work the 1V54 Stirling - Newton Abbot motorail service. Grangemouth quickly provided 5013 & 5096 to work the service to Carlisle, however being without working boilers it was possibly a chilly journey. June: under repair at Glasgow Works, including a repaint. On the early morning of July 31st the 1S06 20.50 (of July 30th) Euston - Stranraer Harbour arrived at Stranraer Town behind 47271, 24096 worked the train forward to Stranraer Town. Four days later 24096 would be in store. Condition no date maybe at withdrawal: blue/yellow livery, gangway doors sheeted over, headcode discs centered on cab front, blue star MU symbols Glasgow style but higher than normal, full size water tank, shortened fuel tank, blanking plates fitted, hand/footholds plated over, three-rung bogie mounted footsteps, flat sided sandboxes. 24096 was withdrawn on August 16th 1975. Page added July 21st 2016. Last updated March 5th 2019.